How can I get a copy of Slackware Linux? Can I buy copies of Slackware Linux? Can I buy Slackware gear? Why spend money if I can download Slackware Linux for free? Who are the people behind Slackware Linux? What is this talk about stable and current versions? How can I verify my copy of Slackware Linux? How do I install Slackware Linux? How do I upgrade an existing Slackware Linux installation without re-installing? Where do I get more information on Slackware Linux online? Where can I find commercial support for Slackware Linux? When will Slackware Linux "x.y" version be released? Does Slackware Linux work with my hardware or peripheral? How do I install/upgrade/remove software in Slackware Linux? Why doesn't Slackware Linux have my favourite "XYZ" software included in the CD/DVD? Why doesn't Slackware's package manager do dependency handling? Why does Slackware take so long to boot up? Slackware Linux has a reputation for being tough for newbies. Is this true? This document answers questions frequently asked about Slackware Linux. If you have any specific topic in mind for the FAQ, create a heading for the FAQ entry, under an appropriate section, and provide your answer. If you cannot answer it, then somebody else might have the answer. Either way, the FAQ is a great way to build up tidbits of knowledge that might otherwise not fit into an entire article. If the answer is too long to fit comfortably into two or three paragraphs, consider adding a link in the answer to an existing page that answers the question or create a new page if one doesn't exist on the topic and the question is important enough to justify a page. See the Slackware Linux page. Slackware Linux can be obtained for free by downloading the disc images directly from the internet(FTP), Internet mirrors and via BitTorrents . Absolutely, just go to the Slackware Store. You bet, just go to the Slackware Store. Slackware Linux is developed by Patrick Volkerding as a full-time job. The sale of Slackware Linux CD's, DVD's and paraphernalia is his only source of income. The core team of developers working with Patrick do not get paid, but should Patrick have to stop developing Slackware because he can no longer support himself enough to do so, the distribution will then have a very uncertain future. Patrick Volkerding is the founder, project co-ordinator and chief maintainer of Slackware Linux. He is also known as BDFL (Benevolent Dictator for Life). Several active contributors also help Patrick maintain the distribution. LinuxQuestions.org did an interview with Patrick Volkerding recently. That interview covers a lot of ground, including mentions of past and present contributors, their involvement, and a brief history of Slackware Linux. Present contributors include Eric Hameleers (aka AlienBOB), Robby Workman (aka rworkman), Stuart Winter (aka MoZes), Eric Jan Tromp (aka alphageek), Alan Hicks, Mark Post, Fred Emmott, Vincent Batts, Heinz Wiesinger (aka pprkut) and several more. Slackware basically comes in two flavors: stable and “current”. Stable versions are the numbered releases (12, 12.1, 13, 13.37 etc.). They are supported for a number of years after release, by way of security updates. Security updates are added to the the “/patches/packages/” subdirectory of a Slackware release tree on every public mirror. Functional updates are not added to past releases. The “current” branch on the other hand, is a development tree which is always split-off from a recently released stable Slackware directory tree. Usually this split-off happens some weeks after the stable release. It marks the start of a new development cycle towards the next stable release. At the end of a development cycle, a Slackware release is created by renaming the top-level “slackware-current” directory to “slackware-NEWVERSION”. Slackware-current is known to cause relatively frequent and potentially disruptive updates to the system. New users and users looking for a stable system for production use should always use a (fairly recent) stable release. The Slackware developers assume that anyone running slackware-current realizes that he/she is in essence, a beta tester. Stable is built on rock-solid components, with well tested software. This recommended version will fit your desktop or server needs. Current is the testing ground for the upcoming release. The software you will find there will often be upstream's latest version. For more information on current, please visit the dedicated page. If you want to know when the next version will be released (at time of writing the most recent stable release is 13.37), it will be ready… when it's ready! There are no fixed release dates, as the Slackware goal is to deliver the most stable Linux experience. This message (gpg: Good signature) means that the ISO file is the same file which was cryptographically signed by Patrick Volkerding. Read the page on Slackpkg, particularly the full system upgrade section. To track the “Current” branch, read the page on Slackware-Current. If you wish to perform a major upgrade from an earlier release to the latest stable version, you should read and follow the instructions in UPGRADE.TXT and CHANGES_AND_HINTS.TXT files provided in the official Slackware CD/DVD or internet mirror for the appropriate version (that is, the latest version). Before upgrading the system, it is recommended that you always make a complete backup of your data. A bunch of links to valuable online sources of Slackware information can be found on this page. The officially recognized web forum for the Slackware community is at LinuxQuestions.org forums. The official Slackware website lists some companies which offer Slackware Linux technical support and consulting. It is probably better to make local inquiries in your city or town for Linux related tech services if you need hands-on support. The local LUG (Linux User Group) might also prove to be a valuable source of advice/information. No, there is only one edition of Slackware. Slackware is a general purpose distribution that can be configured and customized to the end user's needs. See also the Slackware philosophy for a lengthier explanation for adhering to the KISS philosophy. Slackware Linux does not have a fixed release schedule. The principle behind this is to release when ready and not before. There are no six-month release cycles like a few other popular Linux distributions. See the philosophy page for more information. In short, if the Linux kernel supports a piece of hardware, so does Slackware. The distribution's “huge” kernel is compiled with maximum support for most devices and is a pristine, unpatched kernel. So if any Linux distribution is likely to have support for a given hardware device, Slackware should. Be aware that, even if a device is supported by a kernel driver, end user applications and userspace tools to utilize the full functionality of the hardware may be lacking. This is a rather complex topic and may require persistence and patience to research and figure out, especially in the case of low-cost or obscure devices. Use an Internet search engine such as Google or DuckDuckGo, or use a community contributed hardware compatibility list like the LinuxQuestions HCL to find out if your piece of hardware works on Linux or not. For printers, CUPS and OpenPrinting.org are good sources to look for device compatibility. HP printers and MFDs (Multi-Function Devices) have their own open source drivers at HPLIP. For supported scanners, take a look at the SANE project. For webcams, and USB video class devices, Linux UVC drivers & tools can help. Linux supports several models of Wacom pen tablets and devices. See the linuxwacom project for more information. Many non-wacom tablets are supported by the Wizardpen driver. Slackware Linux comes with its own package management tools, namely pkgtool, installpkg, upgradepkg and removepkg for installing, upgrading and removing software packages. makepkg can be used to create packages. See also slackpkg and the page on installing software. The official distribution is small enough for various reasons, the most important one being constraints on developers' time and resources. The short answer is that the official Slackware distribution cannot carry every possible open source application that might be needed by its users. However, Slackware still provides a large number of applications that are needed by most users. Note that the licensing of some software may only permit redistribution in source form. Please do not redistribute or make available online any binary packages of software you compile from source unless you are sure the license permits it. Also avoid packaging and redistributing proprietary software without the creator's permission. There are quite a few trusted and well-respected individual Slackware contributors who make their SlackBuild scripts and binary packages available online. One source is AlienBOB's repository and another is Robby Workman's packages. SlackBuilds.org is a community source of high quality and tested build scripts that make it easy to install third-party software on Slackware, and sbopkg, makes processing SlackBuilds easier. Another option is to use binary packages from Slacky.eu or other binary Slackware package sources. Note that packages are contributed by the community and the quality of packaging may vary from person to person. Still another option is to convert rpm packages to Slackware packages by using the tool rpm2tgz. src2pkg can be used to build packages from source, and to convert other package formats (.deb, .rpm) to Slackware packages. The cpan2tgz program is able to build Perl modules into packages. Last but not the least, intermediate to advanced users generally prefer to compile from upstream sources or write their own SlackBuild scripts. Automatic dependency handling requires constant manual developer maintenance, and adds potential for dependency hell. The official Slackware Linux distribution is anyway meant to act as a cohesive whole. Hence, dependency management is largely moot as installing the entire distribution (the recommended way) takes care of most dependency problems. Several popular Open Source applications can be compiled with different dependencies based on compile-time configuration switches. This makes dependency handling harder and more error-prone for binary redistribution of third party software. Slackware Linux official distribution does not have the resources or manpower to manage dependency handling for third party software, which is a complex undertaking, requiring a lot of testing and is prone to errors as already noted above. However, there are still solutions for third-party software automatic dependency handling for those who want it. slapt-get is a package manager that adds dependency handling for third party package sources like LinuxPackages.net and Slacky.eu. Salix OS is a Slackware derived distribution that incorporates dependency handling. Yes, many distributions have package managers that do dependency handling and do them well. Indeed, there are many choices in that regard. The Linux community still needs a stable, tried and tested distribution that doesn't. Slackware certainly fills a niche in the Linux community in that regard. But as always, preferences vary and many Linux users do prefer the bare simplicity of Slackware. One thing to bear in mind is that the core simplicity of the package management in Slackware has one significant side benefit: there will always be third-party enhancements and solutions to commonly faced issues. Some may call it a bug, others may call it a feature. Be it so, Slackware remains committed to its core principles and this issue is one aspect of its core principles. By default, Slackware installs the huge kernel, which has built-in support for all possible hardware drivers. This may increase you boot time as the kernel probes for hardware at startup. You can switch to the generic kernel by following the instructions in the file /boot/README.initrd. See also: how to set up the generic kernel. navigate to Setup item and press Enter then navigate to services item, mark it with Space key and press Enter then clear mark in front of [ ] httpd item with Space key and press Enter. Finally, select Exit end press Enter. Also, Slackware runs a bunch of X/GTK related scripts at startup for multiuser runlevels (fc-cache, update-mime-database, gtk-update-icon-cache, update-gtk-immodules, update-gdk-pixbuf-loaders , update-pango-querymodules etc.). These may be disabled manually by commenting out those lines which refer to them in the file /etc/rc.M but don't disable anything unless you're absolutely sure you know what you are doing! These scripts are essential for GTK applications to render fonts and icons properly. Unless you are a fairly advanced user and know what you are doing, do not attempt to modify or disable any of the boot scripts. Does a few extra seconds gained while booting really make a big difference? Read The Slackware way to find out what you can expect from a distribution like Slackware. While Slackware certainly is different from many other distributions, whether easy or difficult to use is a matter to be decided entirely by the individual user. 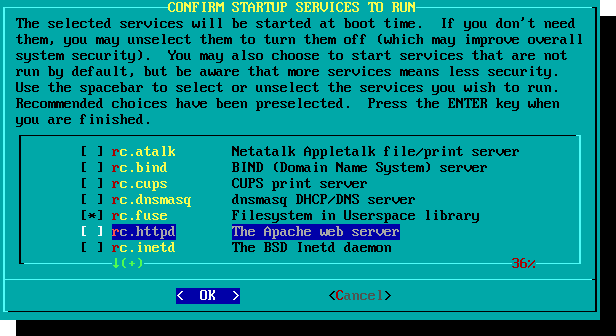 Slackware has a text-menu based (ncurses) installer and requires several technical decisions to be made at install-time, some of which can be potentially destructive to the data on the hard disk. In other words, when in doubt, don't perform any potentially destructive actions and do consult the help documentation. 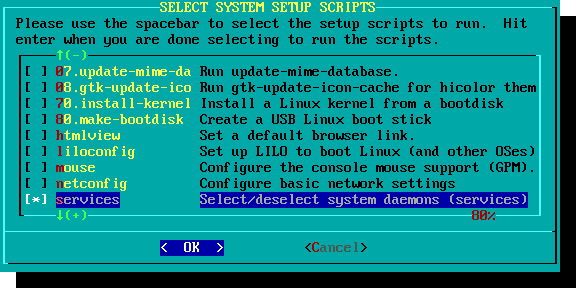 A new Slackware installation initially boots into a text console by default and can be configured to boot into a GUI later, as opposed to desktop-based distributions that boot into a GUI login screen by default. Basic knowledge of standard shell (bash) commands and a text-mode editor such as vim is necessary to start using Slackware comfortably. Some knowledge of the locations of commonly used configuration files and scripts found in *nix-like systems would make things much more comfortable.